Van rentals, convertibles, luxury cars, SUVs and sports cars are some of the most popular & highly rented categories at the San Diego International Airport. Rent a car for San Diego International Airport in just three quick steps - search, compare, reserve! Cancel your San Diego International Airport car rental for free, up to 48 hours before the pickup time. San Diego International Airport car rental services offered by us cover all the listed USA car rental locations which enables you to opt for one way rental without making a back trip to San Diego International Airport for the drop-off. Our associate suppliers provide big fleets of cars and complementary facilities which cover your journey against unforeseen obstacles like breakdown or collision. These inclusives ensure that when needed you get the supplier’s help without any extra payment. Plan your trip before hand for in case of change of plan, cancelation or modification regarding the duration or pickup date or time can be asked for by our 24/7 customer support team. So if you are disembarking at San Diego International Airport, book a car rental in advance which usually presents lower rates per day unlike instant hire rates which makes your trip more pocket-friendly. Get your hands on the cheapest San Diego International Airport car rental deals from us. Also known as Lindbergh Field, the San Diego International Airport was inspired by aviator Charles Lindbergh‘s famous flight. Located conveniently three miles from San Diego, this airport is also only twenty miles from Tijuana, Mexico. Over 18 million passengers travel annually, with Southwest Airlines handling over 35% of all air traffic. 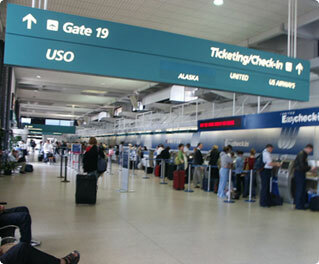 Twenty-three airlines utilize this airport for passengers, and four for cargo on a daily basis. Car rentals are easy to obtain through USA Cars Rental, and when you are visiting San Diego, many places require travel by car. Many things about this airport are unique. Part of this includes what you see, as you are arriving at the airport. For example Petro Park, home to the San Diego Padres, is clearly visible from the airport, in addition to the San Diego Zoo. Strong Santa Ana winds can cause airport operations to reverse flight directions, as can weather that contain a lot of fog or rain. Still, this is a very safe airport and offers many other amenities, like easy access to rental cars. It is an easy drive from the airport to your accommodations when you are driving a USA Cars Rental travel vehicle. Balboa Park – Located in central San Diego, Balboa Park houses many green areas, and the popular San Diego Zoo. Many Bank of America ATMs and currency changers located here on the gate number 20-51.